Today we had two Grape Italian Ice Enthusiasts drive nearly 4 hours round trip (approx 230 miles) for 2 cans of Grape Little Jimmy’s Italian Ice – “the purple kind.” Her husband had the Grape Italian ice last year at Funtown Pier in Seaside Park, NJ and went crazy for it and couldn’t stop talking about it. So as a surprise for his upcoming birthday, Mandy and Margie drove from upstate New York to Elizabeth, New Jersey to grab some of the purple stuff. Let us know if you would like to visit us anytime during the week- we’ll be here! When Little Jimmy’s Italian Ice heard the Space Shuttle Enterprise was flying over Liberty state Park in Jersey City I grabbed my video and drove over to Jersey City to get some footage near the Statue of Liberty from the Jersey side. Pretty amazing- Enterprise actually never flew into space and was the prototype that tested the Space Shuttle for the Challenger. Red Bulls Stadium in Harrison New Jersey. Soccer Fans eating Little Jimmy’s Italian Ice in New Jersey. One of our newest customers just picked up a Little Jimmy’s Italian Ice pushcart from our offices in beautiful Elizabeth, New Jersey this past weekend. The Manes’ have a great location in Atlantic, City, NJ and have all sorts of things lined up for this coming Italian ice season. Now is a good time to get yourself a Little Jimmy’s Italian Ice pushcart- all you need is a good location and events to go to and you’re all set! Give us a call at 800 763 4348 and get started. Here is the video from nj.com from Newark Star Ledger’s reporter Adya Beasley. This is the First ever Italian ice eating competition held in Englishtown, New Jersey at Raceway Park in Englishtown, New Jersey. More photos from the event are below this video. You will also learn how not to get a “brain freeze”…pretty educational actually. What did the big Yellow cup say to the small red cold cup..? Little Jimmy’s Italian Ices and the New York based ALL PRO Eating are shivering with excitement and pride as they announce the first ever Little Jimmy’s National Italian Ice Eating Championship which will take place on June 19th, 2010 at Raceway Park in Englishtown New Jersey. The competition will take place as part of the park’s 35th Annual Snap on Tools Night of Thrills presented by P.C. Richards and Son. In addition to the eating competition, the night will be jam-packed with motor sports fun for the whole family, including jet cars blazing down the quarter-mile track at over 300 mph, wheel-standers, and pro mods. And don’t forget everyone’s favorite – Monster Trucks! Crowd favorites like Grave Digger, Maximum Destruction, and Monster Mutt will be on hand to steal the show with mayhem and car crushing action under the lights, this event is not to be missed! As the East Coast of America emerges from one of its coldest winters on record, several well credentialed Food Warriors are expected to make the journey to compete for the title of National Italian Ice Eating Champion and $1,100 in prize money. Leading the charge will be elite Food Warrior and Sterling Virginia native Ian “The Invader” Hickman whose resume includes many National World Eating titles such as Zucchini, Vanilla Custard, Pulled Pork and Perogies. In addition, Hickman is the former World Record Holder in Chili where he downed an amazing 10.2 lbs of Chili in only five minutes in Canton Ohio in February, 2008. Also, Hickman is a member of Team-USA who competed against the mighty Japanese in Tokyo, in 2007. Also, In addition, female stand out and NJ Canoli Eating Champ “Sweet”Jill Stoler along with the legendary Four Time National 1/4 lb Hot Dog & World Cookie and National Beef Patty Eating Champ, King-George Van Laar from Roselle Park NJ. In addition, NYC Taco Eating Champ Paul “Pork Slap” Arcaria and New York Hard Boiled Egg Eating Champion Chris “The American” Schlesinger are some of the other well credentialed Food Warriors who expected to compete for the Prestigious title of Americas #1 Italian Ice Eating Champ. 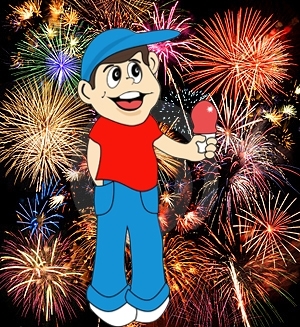 Also on the menu will be Italian Ice Trivia and other fun stuff for kids is planned for this eating extravaganza which will begin at begin at 6:00 PM on June 19th, 2010 at Raceway Park in Englishtown, NJ. Continental Airlines and the Port Authority of NJ held a Special Olympics Plane Pull last month. A good day was had by all with fun for the entire family with all proceeds going to the New Jersey Special Olympics. Little Jimmy’s Italian Ice donated some Italian Ice pushcarts and Italian ice to this fun Family Day at Newark Liberty Airport. Teams of 20 competed to pull a Boeing 737 weighing over 93,000 lbs. on the Continental Airlines tarmac at Newark Airport! NEW SLIDESHOW!! Check out Little Jimmy Live in Action at the Jersey Shore this summer at Funtown Pier in Seaside Park, New Jersey. Click here for a full slide show from Jersey Shore Concessions at the Jersey Shore. 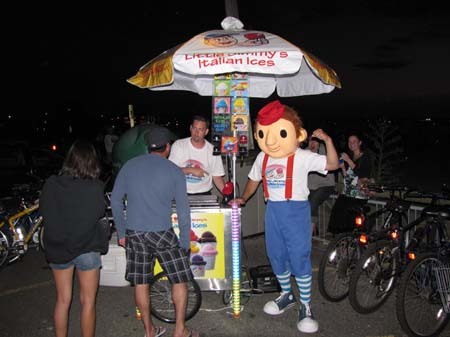 I am a new dealer for Little Jimmy’s Italian Ice and worked my first event on June 27th & 28th of 2009. I wanted to let you know how pleased I am with your product, service, and most importantly, our customer satisfaction. The event I worked was in Nashville, TN where most people are not familiar with Italian Ice, but we still served over 800 customers even though the weather was not favorable. I was amazed at how many people we had who previously lived on the East Coast who were familiar with both New Jersey Ice and Little Jimmy’s quality products. We had another Italian Ice competitor about 45 yards from us in this event, and we had customers who bought from both of us. I received several unsolicited comments that our product was far superior to the product served by our competitor. (Repicci’s – A Franchised Product manufactured in TN) We had 2 vendors who walked all the way back to our booth in the hot sun after purchasing our competitor’s product. They asked us to throw their purchase from our competitor in our trash, and placed a replacement order with us. That blew my mind! I had fun with our customers and would always ask them to taste the product to see if they liked it before leaving our booth. All responses were overwhelmingly positive that produced huge smiles. I usually asked them if they liked it as well as ice cream, and without exception the response I received was: “Better!” I was also amazed over how many requests I had for Chocolate that I had not included in my initial order. I could not be more pleased with the superior quality of your product. We had numerous repeat sales, especially from other vendors working the show. This allowed us to outsell the competition by a minimum of 4 to 1. Most of the time our competitor’s booth was completely empty while we still had people lined up. Quality does matter, and our experience proves people will line up for high quality foods! Thanks for such a great product and for doing such a great job!